If you’re trying add more vegetables in your diet this year, you may turn to canned vegetables—always waiting on the pantry shelf and easily portable to work and ready to eat. But with convenience comes salt, one thing that few people need more of. The American Heart Association recommends 1,500 milligrams of sodium (salt) per day. But the average American’s salt intake is more than twice that: 3,436 mg sodium daily. A single teaspoon of salt contains approximately 2,000 mg of sodium. If you think that this doesn’t apply to you since you don’t salt your food (or add just a slight shake of salt), it’s the processed food—canned, prepared and frozen meals or components—that make us consume more salt than deer at a salt lick. Just look at the sodium content on the nutrition labels of big-sodium canned foods, which include such seemingly innocent products such as condiments, mixes, soups, tomato sauce and any prepared foods or meals. Salt Added and Low Sodium varieties. Photo courtesy Del Monte Foods. Single items sold by fast food restaurants can typically have 2,000 mg of sodium. And many other restaurant meals are also packed with hidden salt. No matter how young and healthy you feel now, control your salt now and you won’t have to pay the piper later—in the form of hypertension (high blood pressure) and other conditions. 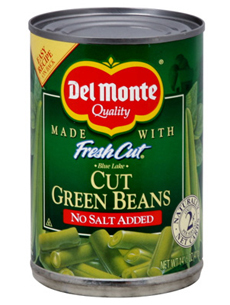 Del Monte Foods and Green Giant both have reduce-salt and no-salt-added options, as do many healthy and organic brands. If you can’t find enough reduced-salt options in your supermarket, check out the nearest natural foods store. Instead of salt, add flavor to foods with your favorite herbs or spices. The line of Mrs. Dash herb and spice blends makes it easy. Here’s more useful sodium information from the American Heart Association.